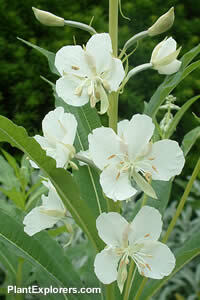 This spreading, rhizomatous perennial has willow-like, pale green leaves and saucer-shaped white flowers in mid-summer. Height 5 feet; spread 3 feet. For maximum freshness, please keep seed refrigerated in its original packaging until it is time to plant. Sow seeds in autumn into pots using standard loam-based seed compost mixed with coarse horticultural sand. Mix to a ratio of 1 part compost to 1 part sand. Cover with coarse horticultural sand and place outside, exposed to all weather. Germination takes 1-6 months and can be erratic. Grow in humusy, moist but well-drained soil in full sun or part shade. Deadhead for repeat flowering and to prevent seeding.